Haben Sie ein Haustier? Dann sind Sie mit den Situationen in diesem Artikel bestens vertraut. Hier lernen Sie, wie Sie einen Besuch beim Tierarzt auf Englisch bestreiten. Do you have a pet? If so, you will be familiar with some of the situations described below. We present language to talk about going to the vet’s. Polly is a veterinary surgeonTierarzt/-ärztinveterinary surgeon. 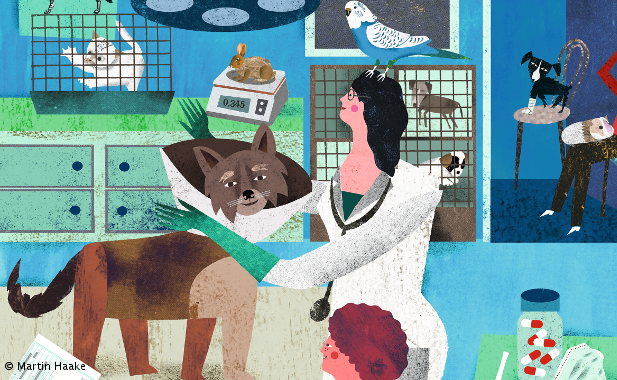 Here, she describes her work at a veterinary practiceTierarztpraxisveterinary practice in south London. Most of our patientPatient(in)patients are dogs or cats, but we also to treatbehandelntreat other small animalsKleintieresmall animals, such as pet rabbitHauskaninchenpet rabbits, tortoiseSchildkrötetortoises, birdVogelbirds and even fishFischfish. Before the surgeryhier: Praxissurgery opens at 8 a.m., the nurseTierarzthelfer(in)nurses feed our inpatientstationäre(-r) Patient(in)inpatients and clean out the kennelHundehüttekennels and cageKäfigcages. The waiting roomWartezimmerwaiting room is always full, but not all our patients are sickkranksick. Our work involves preventative healthcareGesundheitsvorsorgepreventative healthcare, such as giving pet ownerTierhalter(in)pet owners advice on nutritionErnährungnutrition, hygieneHygienehygiene, wormingEntwurmungworming, flea treatmentBehandlung von Flohbefallflea treatment and other forms of parasite controlParasitenbekämpfungparasite control. People bring their petHaustierpets for dental check-upsZahnuntersuchungdental check-ups, vaccinationImpfungvaccinations or to have them microchippedmit einem Mikrochip versehenmicrochipped or to spaysterilisierenspayed (also called to neutersterilisierenneutered). We also to performdurchführenperform more complex surgeryOperation, Eingriffsurgery, but some of our patients have to be to refer toverweisen, überweisenreferred to a specialisthier: Facharzt/-ärztinspecialist. There’s only one thing I don’t like about my job: telling someone that their beloved pet will have to be to put downeinschläfernput down. But it’s all in a day’s work! Click the hotspots in the image to discover the vocabulary. You will find a list with translations below.